What experiences drive this approach to ethics and policy? 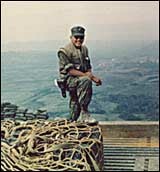 Imagine a young Marine Corps Lieutenant straddling the Ho Chi Minh trail along the border between Vietnam and Laos during Operation Dewey Canyon in 1969. He is confronted with an ethics and policy dilemma. Deep in the bush, a squad leader who has just joined the platoon caught a young Marine sleeping on watch and beats him severely. Both offenses, sleeping on post and beating a subordinate, are serious offenses under the Uniform Code of Military Justice. After talking to them, the Lieutenant gives each one more chance. He makes it clear that if either commits another offense, he will be court-martialed. Weeks later, however, he receives a letter from the outraged mother of the Marine who had been beaten. She concludes a very caustic letter with the question, "What kind of a unit are you running over there?" Purpose. The broad purpose of the Marine Corps is "to fight our countries battles in the air, on land, and sea." As part of the Ninth Marine Regiment, our purpose in being was to block a North Vietnamese invasion during the Tet holiday. Vision. The desired situation was that the North Vietnamese would not invade the city of Danang would be secure, everyone would get home safely, and the world would be somehow safer for democracy. Otherwise, his Marines would fight bravely and well and repel the invaders through a strong forward presence, aggressive patrolling, and night defensive positions along the Ho Chi Minh trail. Views of Reality. The current reality was that everyone in the unit was exhausted; the unit was under strength due to casualties and a lack of resupply because of the monsoon weather. Leadership at every level, though disciplined and tough, is compassionate, embracing a parental "teacher-scholar" philosophy. We value the unique contribution that each Marine provides. Trust abides at every level. We encourage initiative, and shift authority downward, understanding that to err is human, and growth comes from allowing Marines to learn from their mistakes. Our families are part of our Corps. They are participants, not observers. His decision, Second Lieutenant Kenneth W. Johnson wrote to the mother, was the one most calculated to achieve the many purposes of all those involved and affected. Weeks later, he received a letter from the mother. "I understand now," she wrote and concluded: "God bless you, and take care of our sons." While the actual correspondence is lost in the mists of memory, the difficulty of answering that letter, and the mother's response, has stuck with him over the years.